Short, sweet and to the point, the Dukes Creek Falls trail leads you to the waterfalls in a 1.1 mile trek with many observation points to see the falls. As one of the ADA-accessible trails, all levels of fitness can enjoy this short trek to the waterfalls. If you’re travelling through the Blue Ridge Mountains, or even staying in nearby Helen, this is an approachable trail and a perfect place for beautiful nature photography. Just 0.1 miles up the trail, a paved trail leads to the first observation platform. It sits above a gorge and offers distant views of Dukes Creek Falls. The trail then descends into the gorge for almost a mile, traveling over a series of stairs and a few switchbacks to a set of observation platforms that present the Dukes Creek Falls at varying angles, which give plenty of options to shutterbugs. During your hike, look south to see panoramic views of the Raven Cliffs wilderness and Mt. Yonah. It is recognized by a rounded wave-like peak. The highest point of this trail is at the beginning, for once you descend into the gorge, you’ll find yourself in thicker tree coverage. 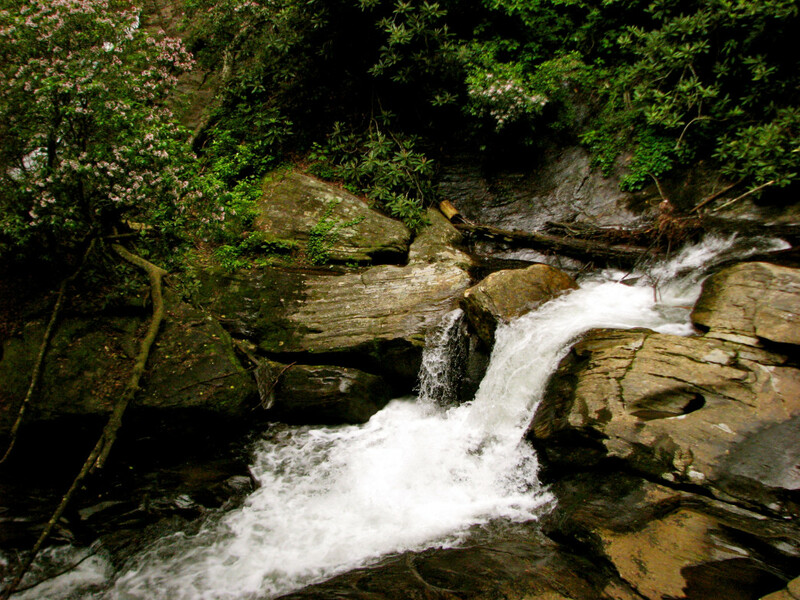 The 150-foot Dukes Creek Falls spills over a series of jagged, geometric shaped rocks into a pool of calmer waters. The falls were named after one of its creek sources, Dukes Creek, however the falls are also made up of the stream from Davis Creek too. These falls are constantly changing depending on the amount of water flow cascading down the maze of boulders, so they're worth visiting again and again. From a higher observation deck, you can see the thin rushing water round out as it reaches the bottom of the falls. On the return trip, the mild climb warrants an excuse to take a detour to Davis Creek. Take the short path to the left to check out the pristine waters of this stream. It’s not a bad place for a dip to cool off either. Moss-covered rounded rocks rise from the water as they cling close to the banks. Photographers can hike the 1.1-mile trail with tripods and other typically cumbersome equipment without much effort. The waterfalls make for spectacular photos. The trail has no limits, nearly everyone no matter age or level of fitness can make the 1.1 mile hike to the falls. The trail offers several observation platforms that are accommodating for families and less-experienced hikers. There are even benches along the trail, so that those who get weary of foot travel can have an opportunity to rest or sit to eat lunch. 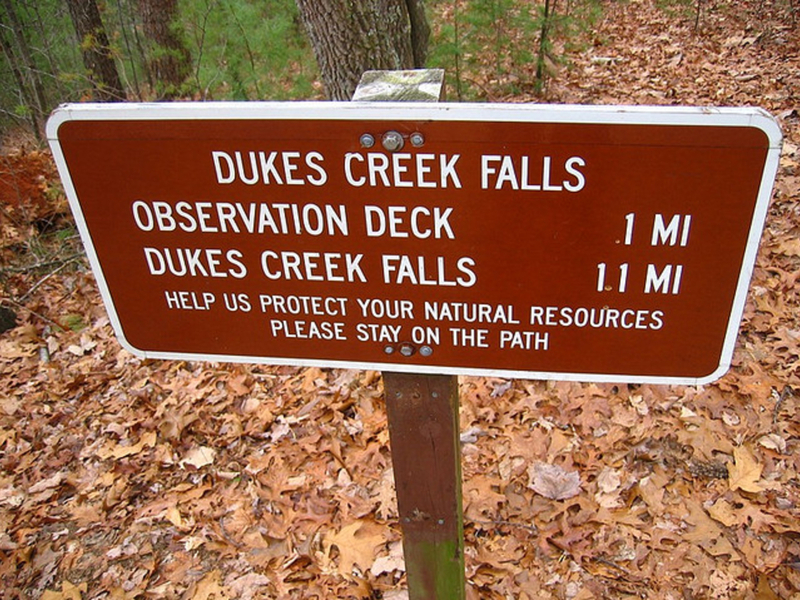 The Dukes Creek Falls trailhead is just off Richard B. Russell Scenic Highway. Restrooms are available at the trailhead. The area includes 4 picnic tables, grills and trash cans, giving families or day trippers an option to spend the afternoon picnicking in nature. There is a $4 parking fee for each vehicle, paid in cash only.